Ralph Abel (84) passed away on April 11, 2019 at the home of his son, surrounded by family members. He was born on May 21, 1934 in Elwood, Utah to Thomas Ammon Abel and Frances Brook. Ralph graduated from Bear River High School in 1952 then attended Brigham Young University and Utah State University where he met his sweetheart Janet Capener. They married in the Logan LDS temple on March 21, 1958. He retired as a senior scientist at Thiokol in 1990 after a career of 32 years. After retirement he worked at Aerojet in Mississippi for three years, then embarked on his favorite career of mowing lawns. Ralph loved gardening and helping others, especially if paid in cookies. For decades he took care of the Hansen and Peterson Parks in Elwood. He served in many church callings including as a missionary in the Northwestern States mission. He also served on the Elwood Town Council and was a member of the Lions Club. 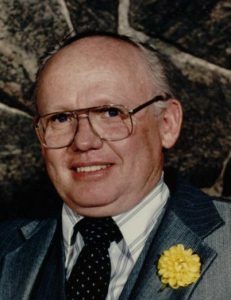 Ralph is survived by his wife, Janet; children, Ralph (Dela) Abel, Tina (Mark) Eagar, Jackie (Doug) Tolboe, and Tim (Jillyn) Abel; 21 grandchildren; 25 great-grandchildren; and two siblings. He is preceded in death by his parents, 11 siblings, and his granddaughter-in-law, Sarah. Services will be held on Wednesday, April 17, 2019 at 11 a.m. at the Tremonton South Stake Center (1150 South Tremont Street). Viewings will be held on Tuesday, April 16, 2019 at the Rogers & Taylor Funeral Home (111 North 100 East) from 6-8 p.m. and prior to the funeral on Wednesday from 9-10:30 a.m. at the church. Interment to follow at the Elwood cemetery.